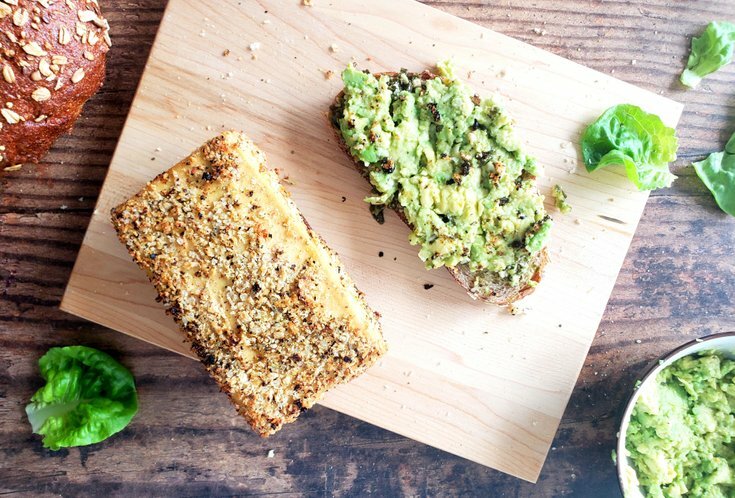 Step up your sandwich game with this lemon crusted tofu sandwich, made with pesto mayo & fresh smashed avocados. Baked not fried, for a healthy lunch. It can be a challenge to think of lunches options, beyond just the classic sandwich. But, if you think about it, pretty much any good meal can be made into a sandwich or wrap. Plus, it's a tasty way to use up leftovers, while not falling victim to daily boring lunches. Why am I saying all this? Well, I had first made this Lemon Crusted Tofu as a main to a side of rice, but then I got to thinking, hmm this would taste particularly good in a sandwich. The basil pesto and smashed avocado really give this recipe a pop of freshness that helps balance out the lemony flavours. There are many different kinds of tofu: firm, extra-firm, soft, or silken. The difference is how much water is pressed out of the tofu, which will make it firmer. We are using extra-firm tofu because it has less water, which will help hold it together while it's baking. Fun Fact: As tofu gets firmer both the fat and protein go up. In a medium bowl, add the lemon pepper seasoning and panko crumbs. Set aside. In a medium bowl, add the flour. Set aside. In another bowl, add the cashew cream. Set aside. Next, cut the tofu into 3 slabs. Use a sharp knife to prevent it from crumbling. Now, dip each slab in the flour, followed by the cashew cream, then the panko and lemon seasoning mixture. 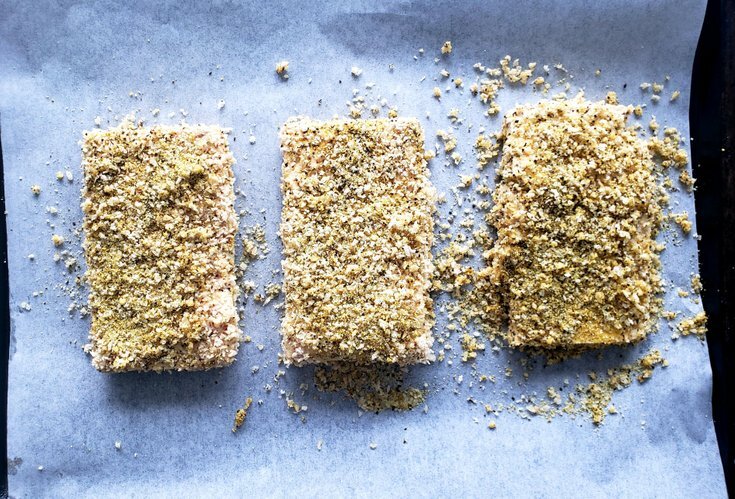 Place each lemon crusted tofu slab on a baking sheet lined with parchment paper. Cook for 10 minutes, flip the tofu, then cook for an additional 10 minutes. This smashed avocado is a great way to add a bit more lemon flavour to the sandwich. So let's do that, use a fork to smash the avocados with lemon juice, minced garlic, a pinch of pepper, and hot sauce. set aside. For the vegan pesto mayo, mix together the mayo and pesto in a small bowl. Yep, it is just that easy. This pesto mayo recipe can be used for other sandwiches or quesadillas too. Set aside. Time to layer all the toppings! You can toast the bread, but you don't have to. I preferred the freshness of the bread, but toasting it will give the sandwich a nice crunch too. 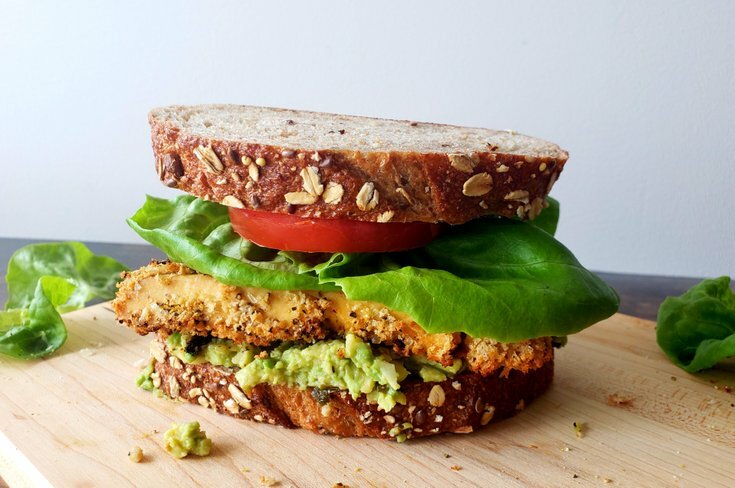 After whatever you decide, distribute the lemon tofu among the sandwiches, followed by a scoop of pesto mayo, a scoop of smashed avocado, a slice of tomato, and a couple of leaves of lettuce. For the panko mixture, add the lemon pepper seasoning and panko crumbs to a bowl. 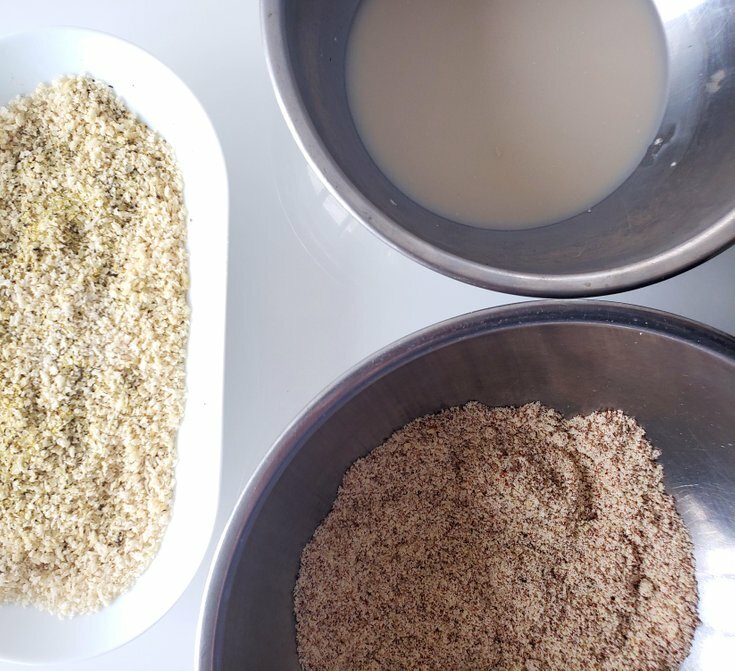 Add the flour to a bowl, and the cashew cream to another bowl. Next, cut the tofu into 3 slabs. Dip each slab in the flour, followed by the cashew cream, then the panko and lemon seasoning mixture. Place each lemon crusted tofu slab on baking sheet lined with parchment paper. Cook for 10 minutes, then flip the tofu and cook for additional 10 minutes. Use fork to smash the avocados with lemon juice, minced garlic, pinch of pepper, and hot sauce. set aside. To make the pesto mayo, mix the pesto and mayo together. Set aside. 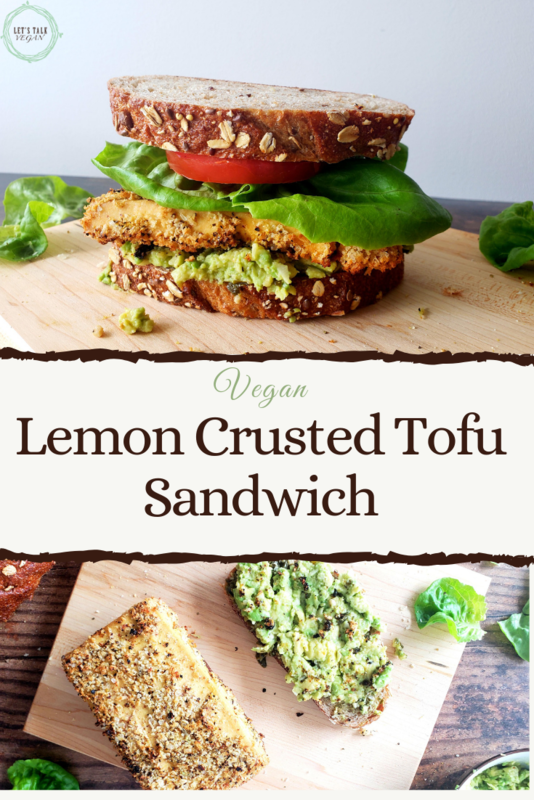 Distribute the lemon tofu among the sandwiches, followed by a scoop of pesto mayo and smashed avocado, a slice of tomato, and a couple leaves of lettuce. Make sure to get a lemon pepper seasoning that isn't loaded with salt.